In a world where many people are racing for bigger homes, more cars, more money, more things – one Orlando Catholic school coach and his family are defying the norm and letting it all go. David Boehm and his family moved to College Park 9 years ago and immediately downsized their home. A second move made them reevaluate even more. They chopped their living space by more than half from 2,400 s.f. to 1,000 s.f. When they noticed rooms filling with storage after their two eldest children left home, the timing to go tiny seemed ripe. Today the Boehms live in a new 250 square foot home and say cutting back wasn’t that hard. “I’ve always felt things are made to be used. When you amass a lot of stuff, stuff sits around a lot,” explained Boehm. His tool collection, for example, once used for building things began collecting dust. “They weren’t fulfilling their purpose (anymore). I know it seems silly, but you can extrapolate that to the way you live. There’s only a certain amount of things you need and use on a daily basis. If more people got into that mindset, there would be a lot less waste and excesses that go around.” He donated all but the basics to the drama department at Bishop Moore Catholic High School. The Boehms continue streamlining their lives, while David remains dedicated to coaching girls’ basketball at Bishop Moore. He believes living in this more economical fashion has put them more in line with nature and the rhythms of life. “You’re more aware of the way you’re using the resources around you and that other people may have needs you weren’t aware of,” he explained. 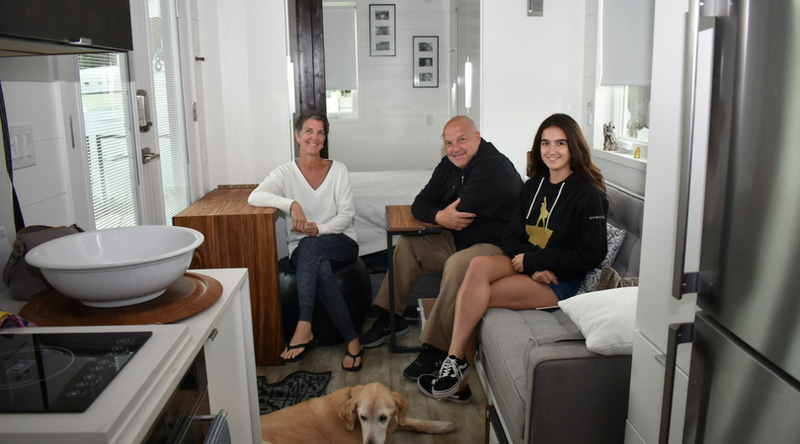 The family’s story will be featured on Tiny House Nation’s new season in September on A&E.